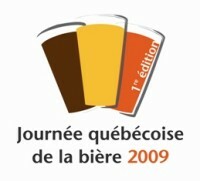 GATINEAU, QC – CBN correspondent Chloe Smith reports that Quebec beer magazine/website Bières et Plaisirs has announced the first annual Journée Québécoise de la Bière (Quebec Day of Beer). On August 15th, 2009, breweries around the province will be giving brewery tours and hosting tasting sessions, and brewpubs will be offering various specials on food and drink. The full list of participating breweries and brewpubs, along with the events/specials they will be offering, is available on the event website.